The William Jewell College Beta Pi Cast of Alpha Psi Omega held a 24-Hour Theatre Festival starting April 20 at 8 PM. 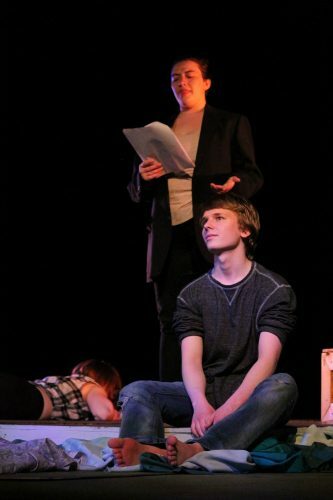 The students had 24 hours to write, direct, stage and produce three one-act plays. 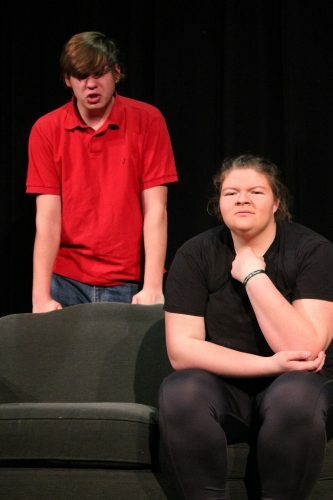 The plays were showcased April 21 at 8 p.m. in Peters Theater. Assistant professor of communication and theatre, Dr. Chris McCoy said he was on the theatre page of the Jewell website one day when he noticed that a 24-hour theatre festival was listed as an event. Since his time at Jewell, they have not put on the event, but he thought it was a good idea and decided to bring it back. The festival was a fundraiser for AIDS Walk KC. Admission to the plays was a pay what you can donation. Additionally, raffle tickets could be purchased to win free drink coupons or Jewell gear donated by the bookstore. Donation jars were also designated for each performance, and audience members were encouraged to drop dollars or spare change into the jar of the performance they liked best. They raised $200 at the event. The event was put on by members of Alpha Psi Omega, members of the Jewell Theatre Company and other individuals who were interested in participating. Participating members were divided into three teams composed of three actors, a playwright and a director. At the original meet-up, each playwright was given a randomly generated topic from Wikipedia’s random article generator. The topic had to be included at some point in the play to ensure that it truly had been written in 24 hours. The three topics were John K. Richards, shishi-odoshi and the Niue Treaty. Terrace Wyatt, sophomore theatre major, constructed a confusing play around John K. Richards, an Attorney General of Ohio in the late 1800s. 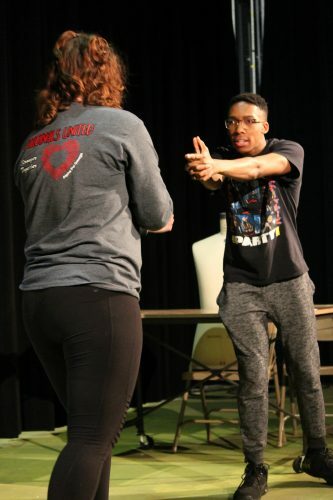 The play, titled “The Ohio Circuit Court” featured Richards, played by junior speech and theatre education major Kyra Little, in a courtroom defending a client who had allegedly hit Wyatt’s client with a car. The scene was hard to follow and quite frankly made no sense, which Wyatt alluded to in his character’s final address. Despite the confusing nature of the show, Wyatt’s play won the audience choice award. Robert Hemphill, junior English major, wrote the second play, “The Shishi-Odoshi Play.” This was the first time that a play he has written has been performed. “The 24 hour constraint is a really good challenge. Being on such a tight leash keeps you from getting too caught up in perfectionism and really helps you to focus on the task at hand,” said Hemphill. Shishi-odoshi is a Japanese garden tool that is used to deter destructive animals. Hemphill did not focus his entire script around the topic but instead only mentioned it briefly. “The Shishi-Odoshi Play” is a quick attempt at parodying the classic ‘very special episode’ episodes of old sitcoms, whose protagonists would in each edition be faced with such problems as peer pressure, crushes, racism, and occasionally even child molestation. I thought it would be funny to try this out with climate change (also a very unfunny topic) and try to tell some jokes through the format anyway,” Hemphill said. juxtaposed with LaDue’s “get over it” attitude did not appease Urquhart, who ultimately settled on writing a strongly worded letter to the newspaper. The final play, “Waiting for Nuie: a Piece/Treaty,” was written by McCoy. Given the topic of the Niue Treaty, McCoy chose to strand his team on a ship in the middle of the ocean. Over the course of the play, no one is able to remember why they set sail in the first place. Lost at sea, captain Caroline Seitz, junior philosophy and nonprofit leadership major, keeps calling for different members of the crew while repeatedly being reminded that all but three sailors had died. While looking for fish, they happen upon a document that happens to be the Niue Treaty on Cooperation in Fisheries Surveillance and Law Enforcement in the South Pacific Region. Given the time restrictions, the plays were entertaining. Any technical errors were effectively obscured from the audience, save a few minor laughs and stumbles. The lighting and sets were simple, yet sufficient. Two of the plays required accents, which were executed without faults. The actors successfully sold their performances despite many attesting to anywhere between zero and five hours of sleep. They plan to host it again next year.